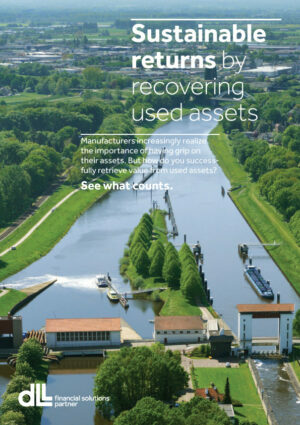 DLL, global provider of asset based financial solutions launches its third whitepaper, ’Sustainable returns by recovering used assets’. This whitepaper is part of DLL’s efforts to further unlock circular economic business and explains how manufacturers successfully retrieve value from used assets. DLL identified financing of used, refurbished and remanufactured assets as a key enabler for a circular business model in the beginning of 2013. Since then, DLL invested in pilots, systems and skills in order to further explore and roll out to its full potential. Today, 2015, 2% of its portfolio consists of second and third life finance. DLL is committed to increase this percentage towards 20% of its portfolio in 2025. DLL is also connecting with other stakeholders worldwide to further help to achieve this transformational change. DLL is member of the global CE100 network and the Circle Economy network in the Netherlands. The Circular Economy 100 (CE100), initiated by the Ellen MacArthur Foundation, is a global platform bringing together leading companies, emerging innovators and regions to accelerate the transition to a circular economy. The programme is based on the principle that more value can be gained from collective problem solving than can be achieved by working alone. The Foundation has created the CE100 programme to support business in unlocking Circular Economy’s commercial opportunity and to enable them to benefit from subsequent first mover advantages. The Ellen MacArthur Foundation has 6 Global partners, of which the most recent one Google joined on September 29th. Global Partners work closely with the Ellen MacArthur Foundation team to identify circular business opportunities and to implement tangible programmes. The circular economy is a regenerative model inspired by nature. It offers businesses a way to deliver value and profitability in a sustainable way. Products are designed to be recycled, reused or remanufactured at the end of the first life cycle, reducing pressure on the planet’s finite resources. It also calls for greater use of renewable energy, reducing carbon emissions and countering the threat of global warming. It promotes the development of healthy materials in products, promoting a non-toxic closed loop system. The circular economy relies on usage rather than ownership of assets. It enables manufacturers to maintain more control on their assets throughout the technical cycle and offers the potential for product services to become an increasingly important profit centre for manufacturers. New service-based financial solutions such as leasing and pay per use are enabling manufacturers to do so. To download the full whitepaper click here, available in English, French and Dutch. Hey Buddy!, I found this information for you: "DLL publishes whitepaper on taking back and recovering value from used assets". Here is the website link: https://www.duurzaam-ondernemen.nl/dll-publishes-whitepaper-on-taking-back-and-recovering-value-from-used-assets/. Thank you.